Never underestimate his determination and resourcefulness. You knew your pooch was clever, but you didn't think he was that clever. So now he can unlock his cage or crate door... it sort of undermines the entire purpose of the contraption, doesn't it? Don't worry, you're not doomed to life with an uncontainable fur ball on the loose. Sure, it may sound obvious, but getting a new cage is a simple solution to your new problem. You probably use an enclosure with a latch lock that flips up and down -- dogs easily learn to work those. Since your hairy little Houdini lacks opposable thumbs, a lock that requires these versatile digits is your best bet. If you don't want to spring for a new cage, find an effective way to enhance the existing lock. Use a leash hook, strong clip, lock and key or other securing mechanism to hold the cage door closed. Just make sure it's something you can easily undo in an emergency. Getting a new cage or enhancing the lock fixes the immediate problem, but it doesn't address why your dog feels compelled to open his cage; dogs appreciate appropriate confinement as a chance to chill out. Don't crate or cage your fuzzy friend as a punishment or to avoid the responsibilities of pet parenting. Ask your vet about appropriate crating times for your particular pooch. Appropriate crating times for puppies generally ranges from half an hour to three hours, depending on age, development, bladder control and other individual factors. Even full-grown doggies shouldn't spend more than four or five hours confined in total all day long. Your pooch should be cool with confinement as long as he's getting plenty of attention and stimulation outside the box. Spend time with your dog every day, playing and helping him get exercise. Don't just send him outside on his own -- that's a form of isolation -- but go out and romp around with him. See that he's got lots of toys and rotate them periodically to prevent him from tiring of them. Also, on the other end of the spectrum, your pet may be overstimulated in that special way. If your four-legged friend isn't fixed, a strong sexual urge may be compelling him to seek out a mate. He won't have any interest in sitting still. 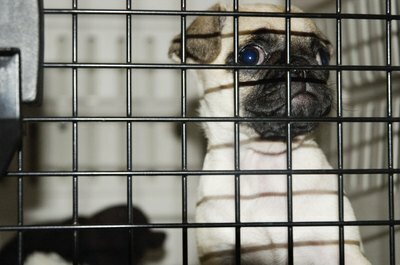 If your doggy isn't willing to tolerate the crate, he may be struggling with stress or anxiety. He might even end up hurting himself trying to get out, so you need to address this. See your vet first to make sure there's no medical problem. Try dog-appeasing pheromones or aromatherapy for dogs to calm your pet down. If things are really bad, ask your vet about drugs or supplements that may be of benefit. If noises, other environmental factors or separation anxiety are bothering your furry buddy, work with your vet or a trainer on a program of desensitization.